Help PIck The Top 10 Most Representative Duran Duran Songs! Interestingly enough, the remaining five songs were not obvious as there were many songs listed that tied by a number of participants. Here’s where you all come in. Help pick those last five tracks by selecting the five songs on the following poll that YOU think best represents Duran Duran! Next week, then, I’ll announce the 10 songs that best represent Duran Duran! I look forward to the final results and I thank everyone who has participated so far and all of you who will help finish the assignments! VIP Packages, Homework Reminder and More! Can I go to Vegas tomorrow? Yes, I’m anxious to hang with my friends and see the band but more than that, I am ready for something other than the polar vortex that I’m currently living in. Yes, Madison is getting pounded. Yesterday, we had a record low of -23 as in 23 degrees below zero. Tonight and tomorrow, we are due for a bad snow storm. I’m seeing amounts of 6 to 9 or 12 to 15 inches of snow depending on the report before we experience wind chills as low as -55. I literally feel like I live in the Arctic. So, as I refresh my weather apps and school closings page, I will focus instead on some fun Duran related ideas. Up until this weekend, I hadn’t given much thought to what is included in the VIP packages for these upcoming February shows. 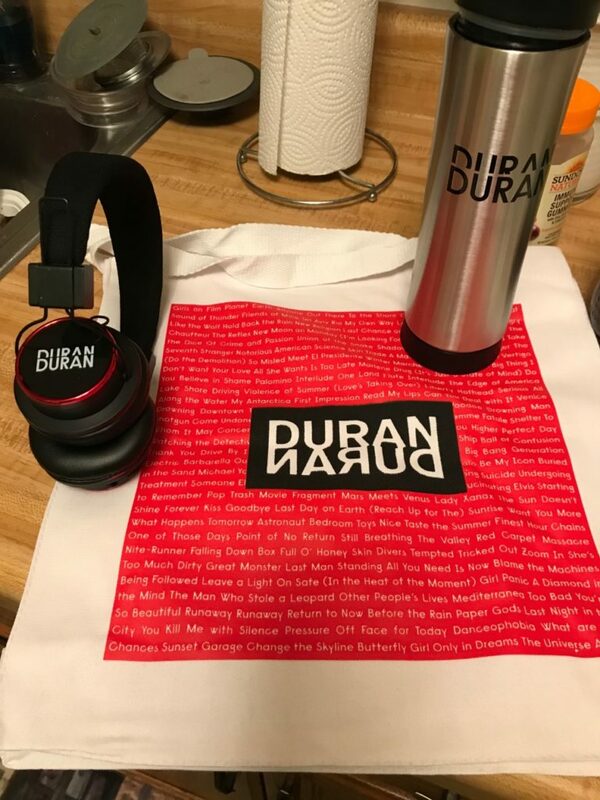 I knew, of course, that they contained Duran related merchandise but I was not sure what was included. In fact, if someone had asked a week ago what it contained, I might have said it had the same stuff as the Paper Gods Tour. I would have been wrong. I already have the travel mug and use it frequently. (Yes, I take it to work.) The best feature? I love that it keeps my coffee warm for a long time especially when I’m at work and often don’t get to my coffee for hours after the day starts. As for the headphones, I have yet to use them but I’m excited to try them out. If you have them, how are they? What do you think about their quality of sound? Durability? The best part, though, in my opinion is the bag. Now, I know what a lot of you are thinking. Haven’t they sent enough canvass bags? Sure. They have included a lot of them but this one is super cool. If you look closely, the words are song titles. Duran Duran song titles. These titles are in order from the debut, self-titled album all the way to Paper Gods. I love it. I am actually thinking about framing it so I can use it as a poster of sorts. The red, white and black theme works for me, too. Next week, you all have a “homework assignment” of sorts due. What am I talking about? Well, I assigned a little task that is due on February 2nd. I am looking for each and every one of you to send in a list of the 10 most representative Duran Duran songs, according to you! You can include any Duran track or even any side or solo project song, if you want. The list you send in can include singles, album tracks, covers, demos, whatever. It doesn’t matter as long as you think the songs show off Duran Duran the best. When you are done with your “homework,” you can send it in to our email (dailyduranie@gmail.com), or through a private message on our Facebook or Twitter. I thank all of you who have already sent in your lists! As I wrap up this little blog post, I turn my attention back to the shows in Vegas. While Rhonda and I haven’t been able to plan an official meet-up in Vegas, we do plan on being around. We get in Thursday afternoon (hopefully!) so by Thursday night, we will be hitting the town. Do watch our social media then about our locations as we would love to have everyone come and hang out with us or at least come by and say hi! On that note, I’m off to check the most recent weather forecast. Wish me luck and send me warmth. Something tells me that I’m going to need it! I was not planning on giving out a new homework assignment anytime soon. After all, I have minimal time to “grade” the homework that would get turned in. Yet, an idea that popped into my head that wouldn’t be pushed down. It started after I bought my plane ticket for the Vegas shows as I wondered what some people who don’t know about my Duranie-ness would think of this. Would they know Duran Duran? Would they GET it? While I doubt that I could really explain my fandom in any sort of easy fashion, I wondered if I couldn’t share some of their music. If I picked the right songs, could non-Duran Duran fans get the full scope of their musical genius? Could they understand why hearing their music live would be a top notch experience? As I thought all this, I attempted to push it to the side to give feedback on campaign speeches, to grade a few more essays and to check in with the parents about how my mom’s cold is. But the idea kept coming back. Every time my brain pondered the upcoming shows, the ideas was there once again. I’m giving up. I’m surrendering. I’m waving the white flag. Finally, I’m just going to embrace it through a homework assignment. The goal is for all of you to ponder Duran Duran songs to non-Duran fans. Maybe this idea can haunt all of you, too! Ha! Your task is to create a list of 10 Duran Duran songs that would capture their musical genius. Think of a person who has not heard any Duran Duran music. What songs would you play to introduce the band to this newbie? What songs might convince a person that they should fall in love with the band’s music, too? What songs are allowed? I will allow any. They could be album tracks, singles, b-sides, bonus tracks, covers or demos. Heck, I don’t care if you include songs from side or solo projects. That said, it might be not so easy to narrow it to 10 but I recognize that non-fans might only have the patience for 10 tracks. So, you need to be able to sell the band as quickly as possible. The assignment is due three weeks from today, February 2nd. Normally, I like to give a month but I think it is quite poetic to have the list due on the date that Duran released their very first single in Planet Earth. Plus, I think this is one assignment that people can overthink. I see it now. People will come up with a tentative list then check it a second time to make changes before doing it again and again, etc. At some point, you have to just call it done. As always, you can turn your assignment in by sending it in an email (dailyduranie@gmail.com) or through Facebook message or through DM on Twitter. Once everyone has turned in their assignments, I will compile the list to see what songs were chosen to be included most often, at the very least. What does songs that we do not need mean? That is up to your interpretation. Could it be the worst songs, in your opinion? Sure. Could it be the ones musically that they missed the mark? Of course. Could it include the least meaningful lyrics? Absolutely. You may take into consideration commercial success of the songs. You may think about ones that fans dismiss or don’t like. 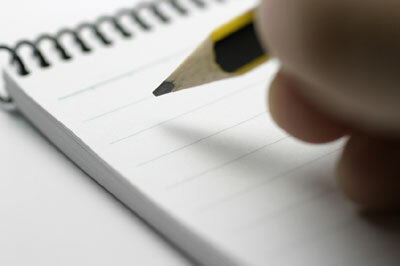 Perhaps, your list will include just the ones that you personally are not fond of or ones you are sick of. It is up to you. Your assignment just needs to include the list of 20 tracks that Duran could survive without. Normally, I would encourage you to put them in some sort of order but that feels icky bad. While you do not need to include an explanation of why you chose the songs you did, if you would like to include that as well, that is acceptable. DO NOT share it publicly. We would like to look at the results and blog about them first. Then, we would welcome each participant sharing. That said, please share this assignment widely. The more Duranies the better in order to produce a solid list. Yes, ideally, we would have a list of the top 40 Duran Duran tracks as decided by Duranies rather than an author from a magazine. The teacher here is not providing a very good example. At all. This weekend, your homework is due. In case you skipped the class when it was assigned, it was basically to come up with your list of the Top 40 Duran Duran songs. They can be any songs as long as the band wrote them. Then, if you were an overachieving type, you would have put that list into order with number 1 being the best song out of the bunch. Many of you have already turned in that assignment via our email (dailyduranie@gmail.com). We appreciate each and every one of you. I personally look forward to reading through the lists and putting the choices together to share the ultimate list of Duran Duran songs with all of you. Unfortunately, I have not been able to complete the homework that I assigned. What a terrible teacher I am! My only excuse is time. Apparently, it is hard to squeeze in fun activities like this when you are working two full time jobs (unfortunately only one is paid). I’m lucky right now that my laundry is done or that there is food on the table. I’m paying bills late. It has been literally weeks since I have been able to actually cook a dinner. Not good. Then, I wonder if others might be in a similar spot in which your Duranie related tasks are getting pushed to the side for more pressing needs. So, the kind teacher thing to do is to simply give an extension. The Duran Duran Top 40 Song Assignment will now be due on Saturday, November 10th. This gives an additional two weeks. As always, if you like to read about the details to participate, go here. Then, finish your assignment and send it to us by email (dailyduranie@gmail.com). Thanks! Not too long ago, I asked the question in a blog about what we should do with the questions of the day. Soon enough, we will be done with this topic of which band member looks best in each video. (By the way, the Nick fans have been voting frequently. Way frequently. This has resulted in him winning pretty much every question lately.) Anyway, I asked our readers for suggestions. I have decided to go with one of them. I am going to ask about Duran Duran interviews but I will do it in a way that you might not expect. I am asking for interviews you have seen and enjoyed. Maybe you want to do a YouTube search then send me a list of interviews. I will be searching for Duran videos, too, but it would be great if they don’t all come from me. After all, I am not a perfect YouTube searcher. Plus, if you have ones that you definitely think I should share then I would love to know about those. 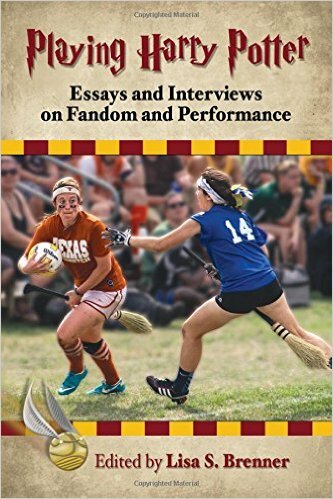 Like other Duranie related tasks, you may send me interviews in a means that works for you. You can send them to us via email, Facebook messenger or Twitter DM. Just share them privately. I don’t care if the interviews are recent or from decades ago. They can feature all the band members or just one. Interviews on side projects or solo material would work, too. All I ask when you share these interviews with me is that you send me the direct link. I would hate to screw up on the interviews you want me to share. How it will work will be like this. I will share the interview and ask for you to watch it and rate it on a scale of 1-5 with 1 being terrible and 5 being awesome. Each day, I will average out the scores. After we have shared all that have been sent our way as well as those that we think are cool, I will post with the Top 10. I think it sounds fun and I hope you do, too. Besides, I’m hoping that I get to see interviews that I haven’t seen before or ones that I have but really enjoyed. I think it might be a fun Duran related activity each day. On that note, I hope that you all enjoy your homework assignments! I know that I will! I look forward to reading your Top 40 list and the interviews you think we should show! Anything surprise you? I was not surprised to see Careless Memories at the top as it often ranks high in other polling and tasks we have done. The same is true with Planet Earth. I was surprised, though, to see Night Boat as high as it is! I certainly would have expected Friends of Mine to be higher. Perhaps, Night Boat is a track, then, that Duran should bust out and do!! Now, I can’t just let people sit back and enjoy the results. Oh no, we need to move on! Here is your new homework assignment!! Directions: You will rank the songs off RIO from LEAST favorite to MOST favorite. Please note: In order to make your determination, you may need to re-listen to the album one or more times. How to turn in your homework: Once you have completed your ranking and are ready to turn in your homework, you will need to head over to the Daily Duranie message board. Specifically, you will post your homework in this thread here: Rank RIO thread. Please note: You may have to register for the boards in order to complete your assignment, if you are not already a member. Of course, even after you post your assignment, you may want to go back to the thread in order to see others’ homework! You can compare your homework to others as cheating does not exist for this assignment! Your assignment is DUE by SATURDAY, DECEMBER 12TH. I will compile all of the results to determine how fans rank the songs off of Rio. From there, we will move on to the other 12 albums. Have fun! Duranie Homework: Rank the First Album! Today marks the first day of the UK Tour! I’m super excited for all of the Duranies who will be seeing Duran Duran perform in Manchester in just a few hours!!! DDHQ has been doing a really good job of getting people excited with pictures from rehearsals and pictures of the stage setup! Personally, I have been seeing lots of UK friends making specific plans for the tour, including getting together with friends before and/or after shows. To say that I wish I was going to be there is an understatement! This means, of course, that I’ll be anxiously awaiting any and all reports from fans in attendance. I’ll be watching for setlist information, descriptions of which songs really stood out, video clips and more!!! In between reading reports, I figure it might be fun to assign and grade a little Duranie homework! Why now? It seems like people will have Duran on the brain, no matter if they have shows coming up or are like me watching from afar! Directions: You will rank the songs off the first album (the self-titled debut) from LEAST favorite to MOST favorite. Please note: In order to make your determination, you may need to re-listen to the album one or more times. How to turn in your homework: Once you have completed your ranking and are ready to turn in your homework, you will need to head over to the Daily Duranie message board. Specifically, you will post your homework in this thread here: Rank the First Album Thread. Please note: You may have to register for the boards in order to complete your assignment, if you are not already a member. Of course, even after you post your assignment, you may want to go back to the thread in order to see others’ homework! You can compare your homework to others as cheating does not exist for this assignment! Your assignment is DUE by FRIDAY, DECEMBER 4TH. I will compile all of the results to determine how fans rank the songs off the first album. From there, we will move on to the other 13 albums. Have fun!